Lock rings are made of high quality cast iron and the lower bracket is made from light weight aluminium material. Elongated camber bolt hole for camber adjustment without the need of special camber screw and bolt. DGR utilises a very well respected and proven monotube damper design combined with high quality components which has gone through numerous rigorous tests and costly manufacturing processes. This design has gained worldwide recognition for its unparalleled performance and it is being used as an OEM stock application in some high end performance cars. The monotube uses a single outer tube and the oil and gas are separated by a free piston, which puts the oil on the top and gas on the bottom. The damper uses a large floating piston which displaces more oil, creating more flow through the valves than the smaller twin-tube piston, this makes the damper much more sensitive to small suspension movements. The high flow in turn makes it more repeatable and enables to achieve an accurate control of the damping force. Monotube design also allows the heat in the oil to transfer directly to the outer surface of the shock body, which is in direct contact with airflow where it can dissipate more efficiently. 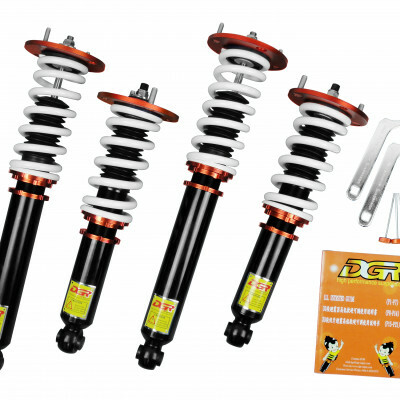 This reduces heat-induced fad, allowing the shock to maintain full damping characteristics as temperatures rise. 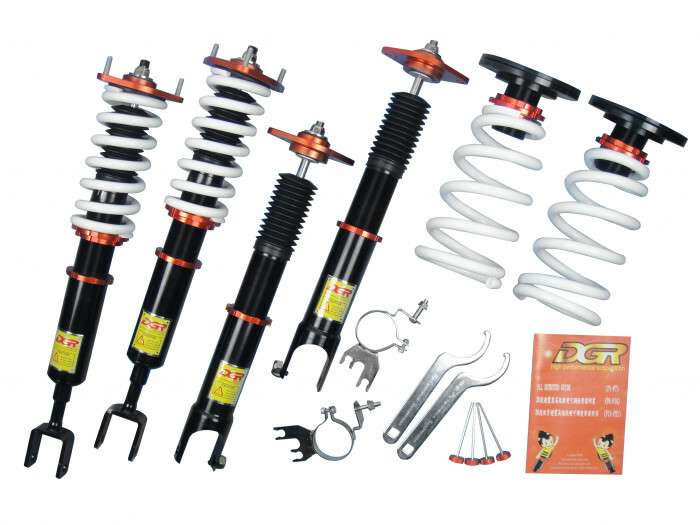 DGR uses a threaded tube body coupled with an adjustable lower mount, offering an independent height adjustment . This means a wide range of height adjustment is available without affecting the spring per-load or the damper stroke length. This allows significant ride height changes without sacrificing shock travel or ride comfort. So whatever height is being set, you will received to optimum performance of the damper. 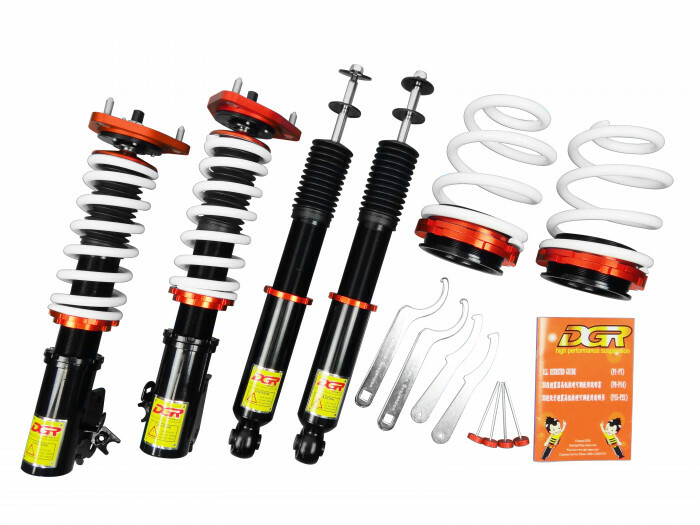 You can raise your car up to factory height for OEM appearance. Otherwise, you can drop your car all the way down for a formal racetrack aggressive outlook which also lowers your centre of gravity. 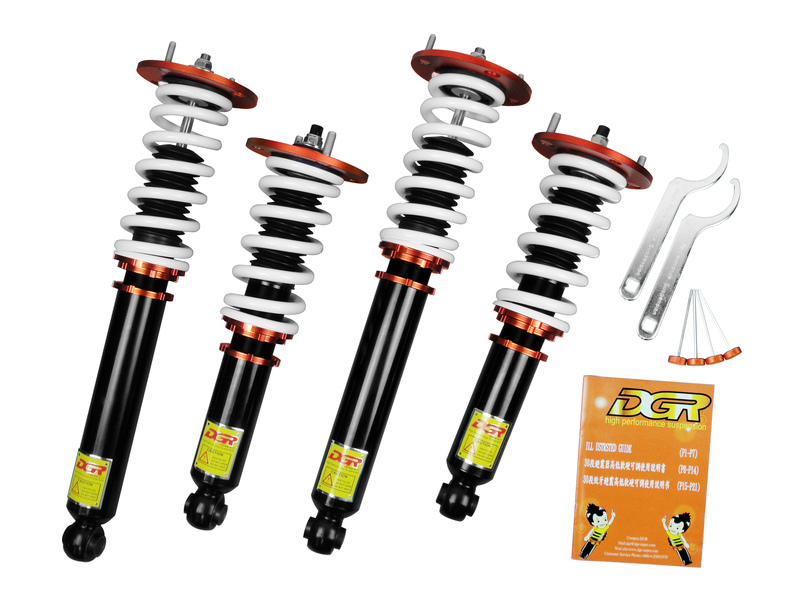 Not to mention, by lowering the centre of gravity from OEM height you dramatically improve the vehicle’s performance and handling characteristics. 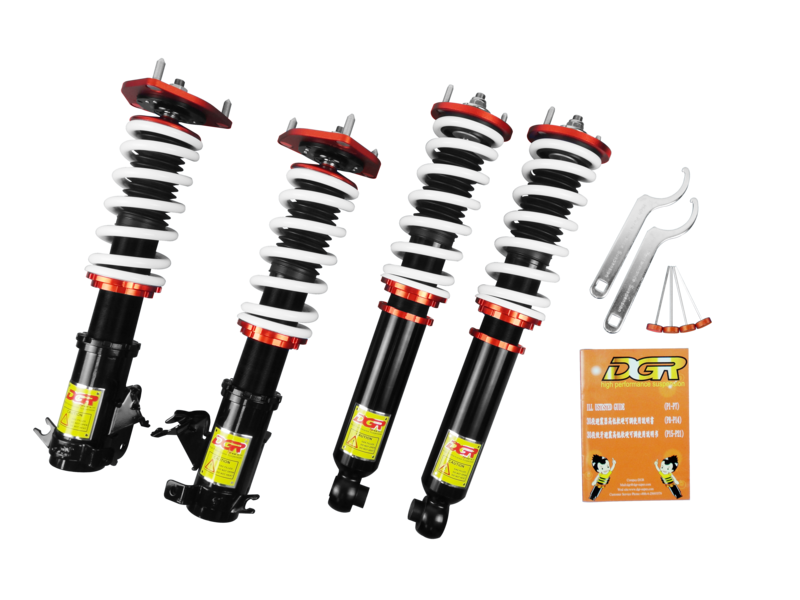 1 Year Warranty (Providing coilovers are installed by mechanic). Please keep the warranty card in good condition & store it somewhere safe in case need to make a warranty claim. Normally ships within 3 Working Days via express courier service. **Images are for illustration purposes & your kit will vary depending on the car model.